Shipston-on-Stour returned to winning ways in Midlands Three West South. The Rams thumped Stoke Old Boys 68-3 at Mayo Road on Saturday with Harry Clark completing a hat-trick of tries. Shipston began the match on the back foot as Stoke came flying out of the traps, forcing the hosts to concede several penalties and easy field position. Stoke took full advantage and kicked a penalty but from then on it was all Shipston who went on to dominate and secure the four-try bonus point before halftime. A succession of slick moves and good link-up play between forwards and backs caused issues for the visitors right from the onset. The ball retention and pace of the game proved difficult for Stoke to live with and the precision of Shipston’s back line wielded several line breaks and good territory for the Rams. The forwards also enjoyed the upper hand at the set-piece. Although the scrums were evenly matched, the Shipston line-out was extremely dominant and brought about huge success. Clark bagged a couple of early tries before a well executed driving maul saw veteran loose-head prop Simon Baldwyn burrow over the line. Robert James and Harry Jackson went over to give Shipston a 26-3 halftime lead. Having already secured the bonus point, Shipston put their foot on the gas in the second half and scored a further 42 unanswered points. 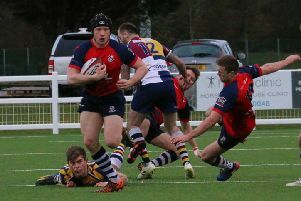 There were tries for George Wilcock, following a tremendous interception and 50 metre dash for the line, Will Cowper, Clark, Jackson, Tobi Faulkner and James to cap off an excellent performance and another valuable win in the context of the league. 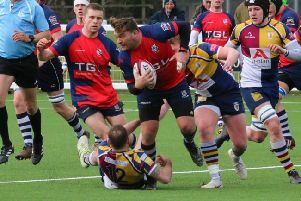 There were several notable performances throughout with Aaron Neal and George Wilcock performing admirably in the forwards as did Jackson, Matt Daniells and Faulkner in the backs. The only down side was the injury to second row George Minogue, who clashed heads with the Stoke winger during a collision, causing a concussion for both players and a couple of weeks on the sidelines for both. But there was a welcome return to action for Charlie Hollies-Everett following several weeks out with an injured wrist and a return to first team action for Will Cowper and Ed Cowper, both performed extremely well when called upon.